I envy people who know exactly what they want in life. You know the type. They said at age 10, “I want to be a ________”, and 20 years later they’re doing just that. It may be a Grass is Greener syndrome, but I feel like life must be so much easier that way. At least one of the major questions in life is sorted out, reliable, consistent, stable. Everything in my life is a question these days. Everything. And I have very few answers. It’s really irritating to be 28 years old and know so little about what you want. I set out on this journey 8 months ago to figure everything (anything) out. I’ve found that the longer I stay away from home, the less I know. Where do you want to settle down? I don’t know. Do you even want to settle down? I don’t know. What do you want to do as a career? I don’t know. Do you want a family? In theory, yes. When do you want to start a family? I don’t know. When will you go home? I don’t know. Not any time soon. Do you miss home? Nope. Everyone I love has found a way to still be part of my life abroad. How long will you stay in Rome? I don’t know. Where will you go next? East. But I don’t know where. Do you like teaching English? I don’t know (yet). It’s difficult to determine when it’s simply a means to an end right now. Despite the constant aggravation of not having any answers, there is at least one thing I know to be true: I am following my heart, pursuing my passions, and living my dream. It is what I am most proud of, and I’m frequently told that it’s more than most people have the courage to do. I wish that weren’t the case. 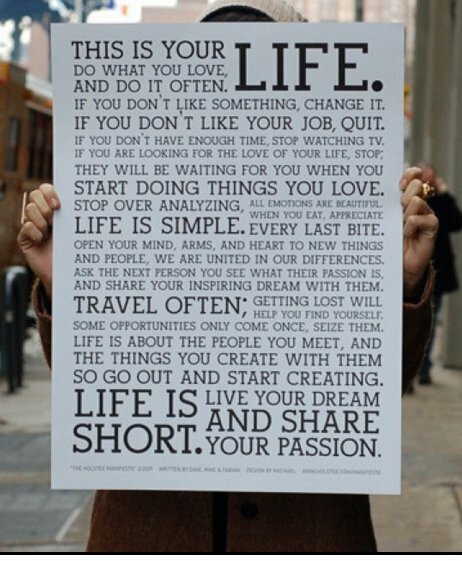 I stumbled across this poster and re-read it for the umpteenth time. Though today, it moved me more than it normally does. It’s a simple message: Do what makes you happy. Whatever that may be, wherever it may take you, regardless of how much “sense” it makes, do it. Life is too short and too precious to be spent following someone else’s dream. Live YOUR dream, share your passion, and love each other. This entry was posted on November 16, 2011 by Katie. It was filed under Ramblings . I’m not sure I envy those people- imagine if your life experience was limited to what 10-year-old-you knew the world could offer! I love you, and I miss you, but I don’t want to see your hiney back on American soil until you’re good and ready (especially if that means we get to celebrate your 90th birthday in Bangladesh). You’ve taught me a lot in the past 25 years, big sis, but I’m most in awe of your courage in leaving the safety of the known to chase those open-ended questions. If this is what uncertainty looks like, maybe answers are over-rated. If youare searching for some sunlight, breaks in Egypt are for you. – this area is ideal for sun breaks spent relaxing. The best platform for sunshine breaks, the vibrant resort of El Sheikh features lots of wonderful accommodations with lots of routines and leisure. all along the Red Sea coast. Compatibles y originales más asequibles.